President Donald Trump and First Lady Melania Trump hosted their first state dinner Tuesday night, playing host to French President Emmanuel Macron and his wife Brigitte Macron. Trump wore a black tuxedo and the First Lady wore a black Chantilly lace Chanel Haute Couture gown that was hand-painted with silver and embroidered with crystal and sequins, according to her spokeswoman, Stephanie Grisham. Macron also wore a black tuxedo as Brigitte Macron wore a cream-colored gown with gold detail. 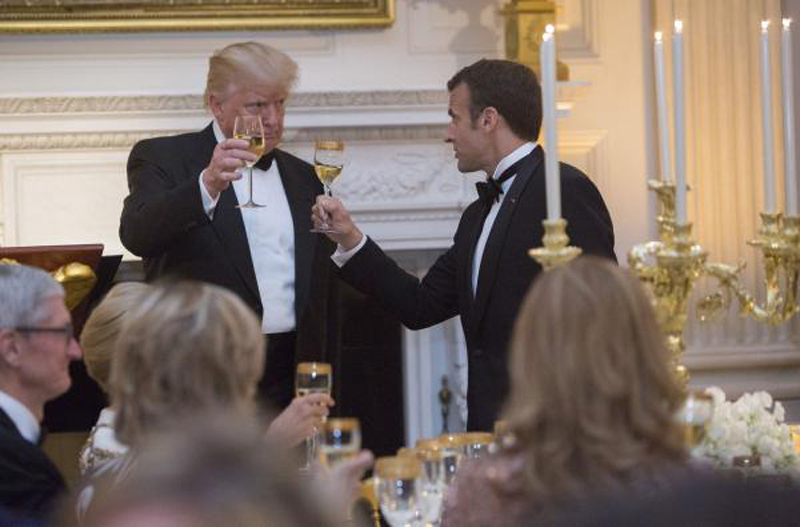 During the dinner, Trump toasted the "nearly two-and-a-half centuries of friendship" between the United States and France. "May our friendship grow even deeper, may our kinship grow even stronger, and may our sacred liberty never die," Trump said, according to ABC News. The state dinner occurred less than two weeks after the two countries, along with Britain, launched precision strikes against the government of Syria after allegations that the Syrian military attacked civilians with chemical weapons. Days later, Macron said he convinced Trump to commit U.S. troops to Syria "for the long term." Other guests at the dinner included Apple CEO Tim Cook; media mogul Rupert Murdoch; secretary of state nominee Mike Pompeo; Supreme Court Chief Justice John Roberts; and the president's daughter, Ivanka Trump.